Alfajores are sandwich cookies filled with dulce de leche, a creamy caramel confection made from milk and sugar. Alfajores have their origins in the Middle East. The Spaniards acquired their alfajor habit from the Moors, and brought it to South America, where alfajores have become an institution. There are restaurant chains dedicated entirely to the alfajor cookie, whose brand names are as recognizable and ubiquitous as Starbucks in the US. (La Casa del Alfajor in Peru and Havanna in Argentina are famous examples, but there are many more). 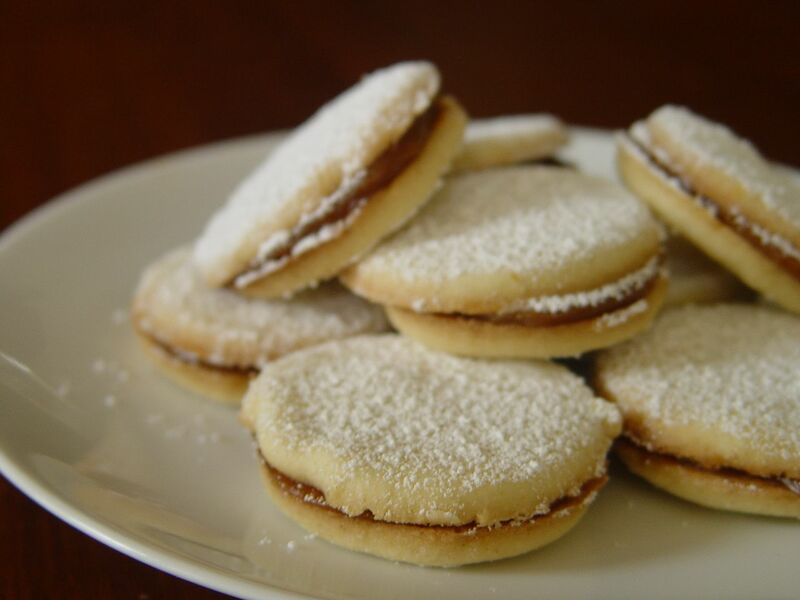 The typical alfajor is made with two slightly sweet shortbread-like cookies. Dulce de leche is the most common filling. There are many variations on this standard - nuts, fruits, and chocolate are popular additions. True alfajor aficionados prefer to eat the cookies a day or two after they are made, when the cookies have softened and melded with the filling. This is the standard alfajor cookie, filled with dulce de leche and sprinkled with powdered sugar. Most people fill these cookies with store-bought dulce de leche to save time, but when made with homemade dulce de leche they are truly out of this world. Soft cake-like alfajor cookies are filled with dulce de leche and then dipped in dark and white chocolate - a popular alfajor variation in Argentina and Uruguay. This Peruvian variation on the traditional alfajor cookie is filled with an anise-flavored syrup in place of the dulce de leche. The result is a slighly sticky but very delicious cookie that keeps well. The cookies are taste a bit like the Peruvian treat called Turron de Doña Pepa. Triple alfajores (pronounced "treep-lay") have a third cookie, allowing for a second filling. The extra layer of pineapple jam makes these alfajores triply good.